Victory points are awarded for each destination station connected to a player's line. 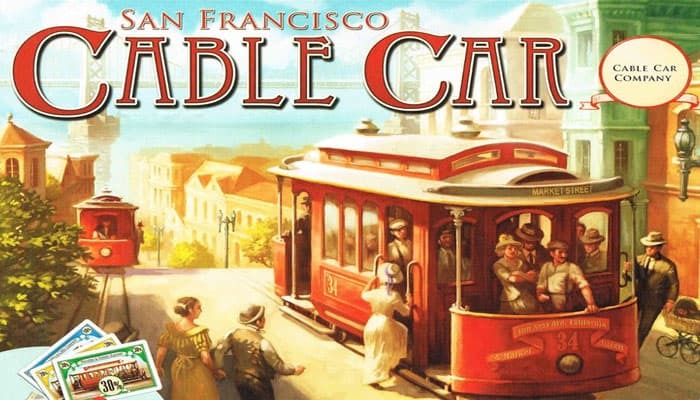 Who will finally be the owner of the most successful cable car company? Place the map in the middle of the playing area. The map shows: 60 square spaces, on which the track tiles are placed, 1 power station with 8 connections in the center of the map, 32 numbered cable car stations at the edge of the map, 1 scoring track running along the edge of the map. Each player takes all cars of their selected color and places them on the map, according to the charts shown below and to the right. The numbers indicate the spaces where the players have to place their cars. 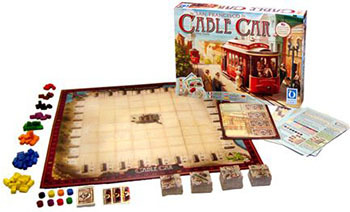 All cars must be placed on the right track (dead end) of the Cable Car Stations, where they remain until the end of the game. The left tracks (little station building) do not belong to any players. Any unused cars are returned to the box, they are not used in this game. All players place their scoring marker on the "0" space of the scoring track. Shuffle all track tiles and place them face down besides the map in easy reach for all players. Each player takes one tile and looks at it without showing it to the other players. The active player (the player performing their turn) places their hand held tile on the map. If they don't want to place this tile they may draw a new tile from the face down supply, as long as there are any tiles left. In this case they must place the tile just drawn, keeping their hand tile. After placing their hand tile the player draws a new tile form the face down supply, as long as there are any tiles left. A player who has connected all their lines to destination stations still keeps on placing tiles. 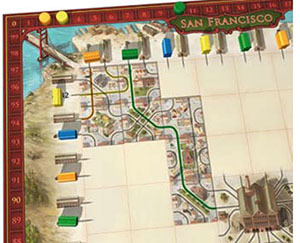 Note: The track tiles have been designed in such a way that all lines are connecting to some station at the end of the game. It may happen though that loops are constructed which do not connect to any station. Such loops are of no relevance to the game. A tile must always be placed on a free space. It must be placed adjacent (edge to edge) to at least one tile already lying on the map or on a space at the edge of the map. All tiles must have the same orientation, i. e. the roofs of all houses must point at the same direction. A tile may not be placed in a way that a cable car line is connecting its departure station with a destination station passing only one tile. The only exception to this rule is when there is absolutely no other way to place the tile. When placing track tiles they may connect to any line. Example: Yellow gains 3 victory points, because his line passes one tile twice. Orange gains 2 VP. Green gains 10 VP; her line consists of only 5 tiles, but it connects to the power station in the center. A scoring takes place as soon as a cable car line has connected to a destination station. The owner of this line immediately gains 1 victory point for each tile their line is passing. If the same tile is passed more than once by this line than it generates 1 victory point each time it is passed. If the line is connecting to the power station in the center of the map the victory points total for this line is doubled. Each player's victory points are recorded on the scoring track using the player's scoring marker. The car is turned by 90° indicating that this line has been scored. Note: The tracks of the powerstation printed on the map do not count for victory points when a line connects to it. Only those tiles actually placed on the map by the players count for victory points. The game ends as soon as all lines have been scored and all tiles have been laid out. The player with the most victory points is the winner of the game. 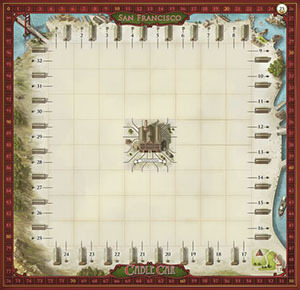 In order to have a better choice when placing tiles the players may agree upon abandoning the orientation rule. Using this variant it doesn't matter where the roof of a tile is pointing at. In order to have a better choice when placing tiles the players may agree upon allowing 2 or 3 hand tiles instead of only 1. Using this variant game play will last longer.